A New Leaf from ‘Otto Ege Manuscript 41’. 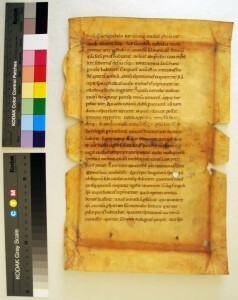 Detached Leaf from ‘Otto Ege Manuscript 41’. 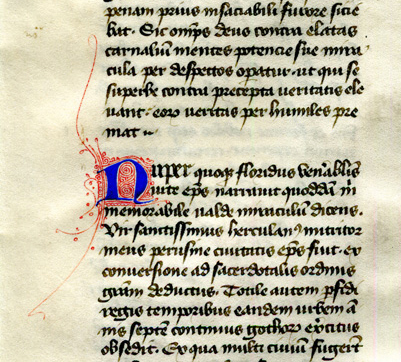 ‘Dialogues’ of Gregory the Great, Book III: End of Chapter 12 and Opening of Chapter 13. Private Collection, reproduced by permission. The reused remnant carries most of the text of Chapter VII in Book III. This Chapter concerns Andreas, Bishop of Fondi (Latin Fundi) in the province of Latina, Lazio, in central Italy, located halfway between Rome and Naples on the Roman Via Appia. Should you wish to travel there, we might suggest, by special request, a guide to its highlights. 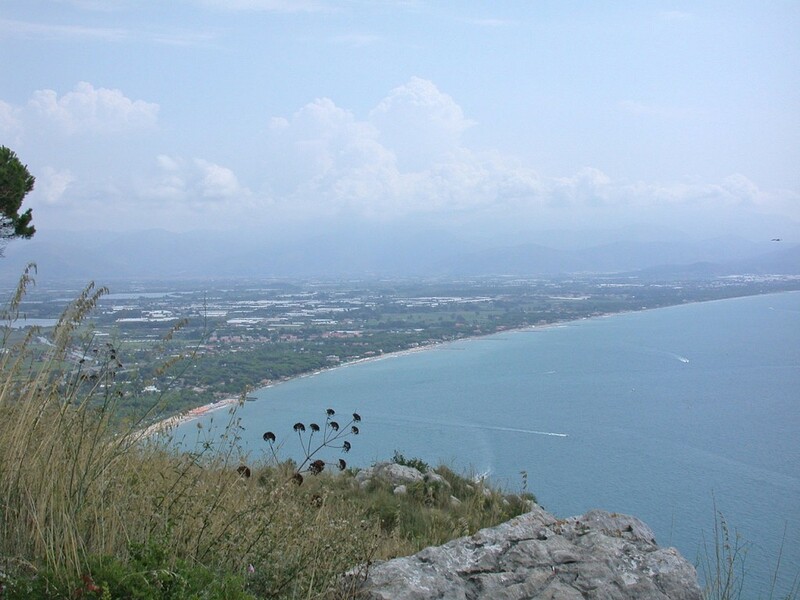 View of the Plain of Fondi from Terracina. Photograph in the Public Domain. 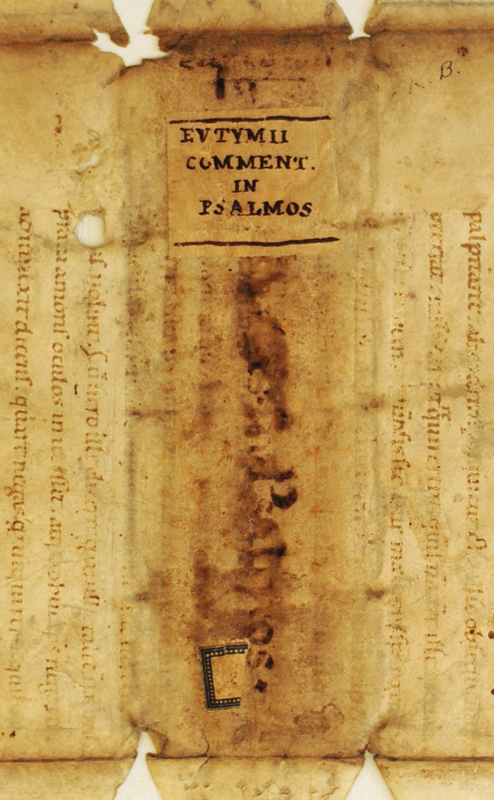 According to the critical edition of Pope Gregory’s Dialogues by Adalbert de Vogüé (1979) used as the standard for locating passages in its text in our Blogpost and its updates on A New Leaf from ‘Otto Ege Manuscript 41’ (with bibliographical citations including English translations of the Dialogues), this reused leaf contains most of Book III, Chapter 7. As laid out in that edition (provided with a facing translation in French), the chapter spans pages 278–284 in Volume II, comprises 10 numbered Sections, and extends for 92 numbered Lines. The Titles for the Chapters in this Book (printed on pages 250–251) report this one as focusing De Andrea Fundanae ciuitatis episcopo (“On Andreas, Bishop of the City of Fundi”). About that Bishop, little seems to be known or supposed aside from this Chapter. Its translation into English appears online freely here. About that English translation. For it, the text of Gregory’s Dialogues was translated into Early Modern English by someone identified by the initials “P.W.” (Paris, 1608). That version was “re-edited” with an introduction and notes by Edmund G. Gardner (London, 1911). The out-of-copyright 1911 text is now placed online in transcription via tertullian.org. Here are Book III and its Chapter 7. But as I am thus busied in telling the acts of holy men, there cometh to my mind what God of his great mercy did for Andrew, Bishop of the city of Funda: which notable story I wish all so to read, that they which have dedicated themselves to continency, presume not in any wise to dwell amongst women: lest in time of temptation their soul perish the sooner, by having that at hand which is unlawfully desired. You get the picture? But there’s more. This Bishop “lived virtuously, and with diligent care, answerable to his priestly function, led a continent and chaste life”, even while he continued to keep “in his house a certain Nun” who had already stayed with him before he became Bishop. For assuring himself of his own continency, and nothing doubting of hers, content he was to let her remain still in his house: which thing the devil took as an occasion to assault him with temptation: and so he began to present before the eyes of his mind the form of that woman, that by such allurements he might have his heart wholly possessed with ungodly thoughts. Enter the Devil, a Jew, and a multitude of “wicked spirits”. Next the Devils. There enter, at “about midnight”, a “troop of wicked spirits walking before another of greater authority”. That greater Devil, seated within the temple, promptly “began diligently to inquire of those his servants, how they had bestowed their time, and what villany they had done in the world.” Talk about Inquisition. The villainous reports included the “solemn relation” of “a notable temptation of carnality” which had been “put into the mind of Bishop Andrew, concerning that Nun which he kept in his palace”. To this “the master devil gave attentive ear, considering with himself what a notable gain it would be, to undo the soul of so holy a man.” And so, encouraged, the reporter “went on with his tale, and said that the very evening before he assaulted him so mightily, that he drew him so far forth, that he did merrily strike the said Nun upon the back.” At this “joyful news”, the Master Devil (AKA “the wicked serpent and old enemy of mankind”) exhorted his agent to contrive “the spiritual ruin of that virtuous Prelate”, with the bonus to the successful perpetrator of a “singular reward above all his fellows”. Talk about Bonuses. Backhanded, At That. Hearing all this, the Jew “was wonderfully afraid”. (Not surprising.) Discovered and questioned by the Devil’s servants as to how he dared to “lodge in their temple”, he was seen to have “the mystical sign of the cross, whereat they marvelled and said: ‘Alas, alas, here is an empty vessel, but yet it is signed”.’ And so, hearing this, all those “hell-hounds” vanished at once. Armed with knowledge of the Devils’ gossip, the interlocutor could find the upper hand. “Why do you deny it,” quoth the Jew, “for is it not so true that yesternight you were brought so far by sinful temptation, that you did strike her on the back?” When the Bishop, by these particulars, perceived that the matter was broken forth, he humbly confessed what before he obstinately denied. Saint Andrew. Oil on Canvas. Artus Wollfort (1581–1641). Private Collection, Public Domain. Via Wikipedia Commons. The Jew, “moved with compassion to his soul”, revealed the source of his knowledge, and told in full the plans of that assembly in the temple. Hearing this, the Bishop “fell prostrate upon the earth, and betook himself to his prayers: and straight after he discharged out of his house, not only that Nun, but all other women that attended upon her”. Next, the Bishop “converted the temple of Apollo into an oratory of the blessed Apostle, St. Andrew: and never after was he troubled with that carnal temptation. As for the Jew, “by whose means he was so mercifully preserved”, the Bishop baptized him. And thus, by God’s providence, the Jew having care of the spiritual health of another, attained also himself the singular benefit of the same: and almighty God by the same means brought one to embrace piety and virtue, by which he preserved another in an holy and godly life. 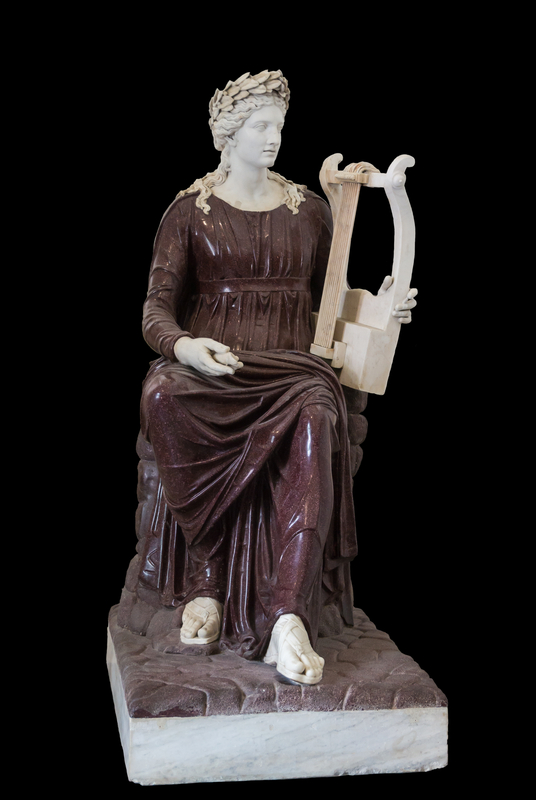 That is not amiss, Peter, for necessary it is that we should both trust upon the mercy of God, and yet, considering our own frailty, be afraid . . . .
Apollo Seated with Lyre. Porphyry and marble, 2nd century CE. Farnese Collection, Museo Archeologico Nazionale. Photograph by Jebulon via Creative Commons. Who knows if the former manuscript included Chapter Titles, either at the start of the individual Chapters or in a Chapter-List at the front of the individual Books, or both? Who knows if the manuscript represented all of the text of the Dialogues (in their 4 Books) or only excerpts, and if it contained some other text(s)? Perhaps some other leaves from the book may come to light to answer such questions. The fragment both begins and ends mid-section. It extends from the opening of Section 2 (Hic namque uenerabilis uir), presumably after an expected quanti et eius loci habitatores existunt concluding Section 1 at the end of the preceding page. 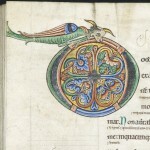 It extends to within an early part of Section 8 (uel quae in conuentu), presumably before an expected malignorum spirituum de eo audisset [or audiusset] at the top of the following page — that is, if its manuscript conformed with the standard as represented by the 1979 edition and its selected witnesses in manuscript and print. Those witnesses are identified, for example, on page 7 of de Vogüé’s Volume II, and described in some detail in his Volume I. 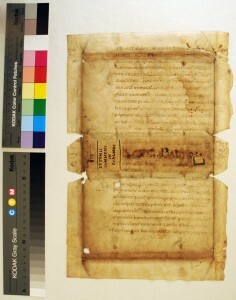 The portion on the remnant corresponds to Chapter 7, Printed Lines 11–71 (out of 92 Lines). The lost Commentary volume has several candidates for its identity. 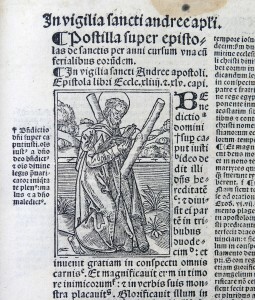 A Commentarius in Psalmos Davidis composed by Euthymius [or Euthymios] Zigabenus appears, in Greek and Latin, in Jacque-Paul Migne’s monumental Patrologiae cursus completus. Series Graeca, volume 128 (Paris, 1864), at columns 41–1326. The author is Euthymios Zigabenos (in Greek Εὐθύμιος Ζιγαβηνός or Ζιγαδηνός), monk, theologian, and Biblical commentator (died after 1118). 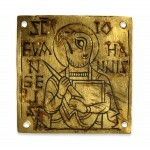 Serving as monk in the monastery of the Virgin Mary near Constantinople, he found favor with both the Byzantine Emperor Alexius I Comnenus and his daughter Anna Comnena. Euthymios’s Commentary on the Psalms stands among his several biblical commentaries, based mainly on patristic sources. 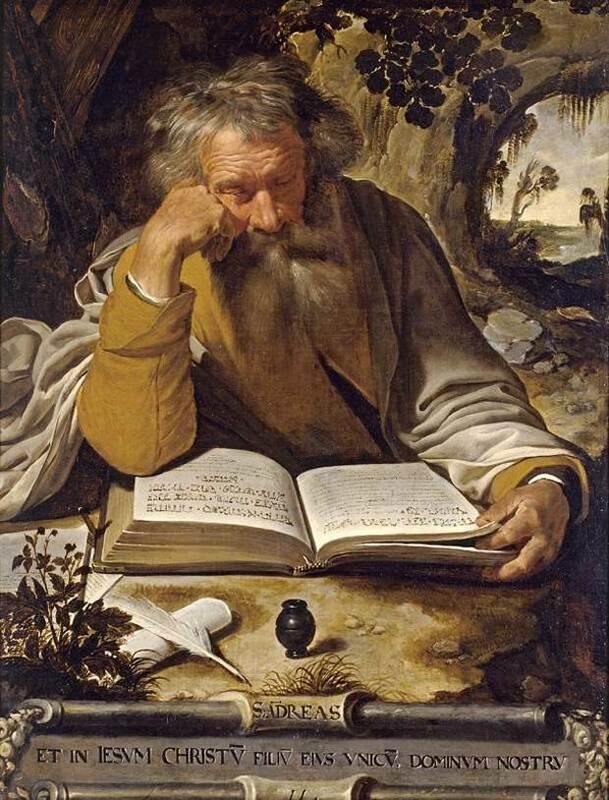 His others consider the Four Gospels and the Epistles of Saint Paul. For the Psalter Commentary, the editio princeps (first printed edition, no mean feat) was prepared by Antonio Bongiovanni, Opera Theophylacti, 4 (Venice, 1763), I, 329–797. 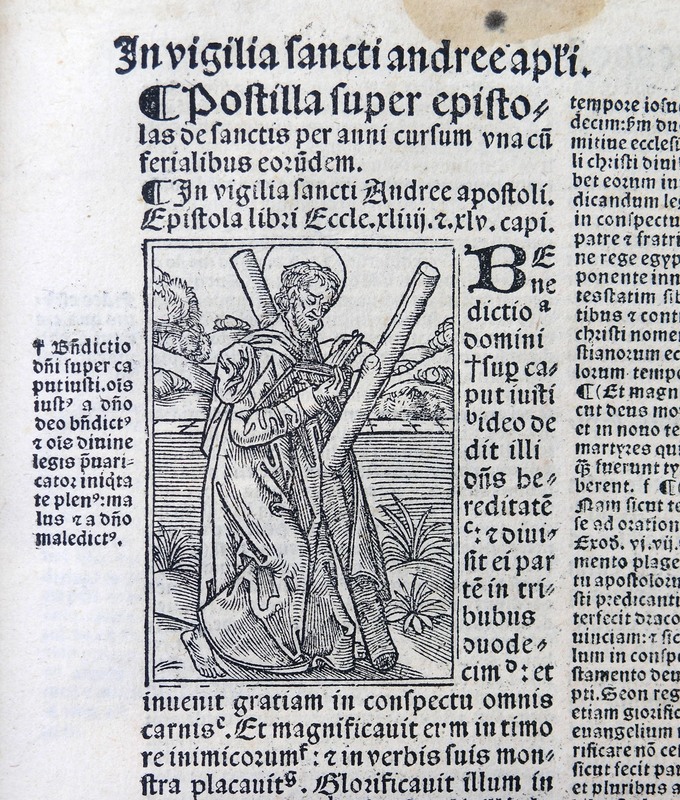 In the Patrologiae Cursus Completus. Series Graeca, this text appears as volume 128 (1864), again as Volume I of Euthymios’s works (here plus here). 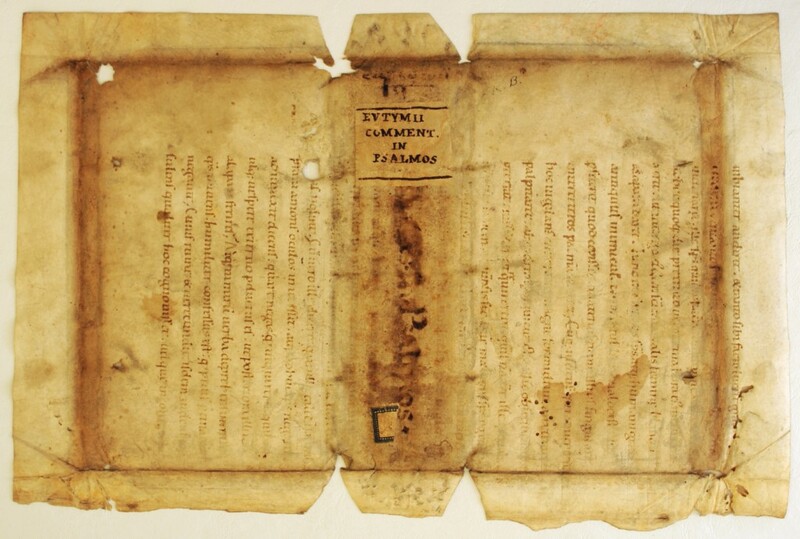 There appears online a bilingual Greek–Latin edition and English translation by John Raffan, as reported enthusiastically by tertullian.org: Euthymius Zigabenus, Commentary on the Psalms – edition and translation completed! The quest continues for the volume which the retrieved leaf once covered. 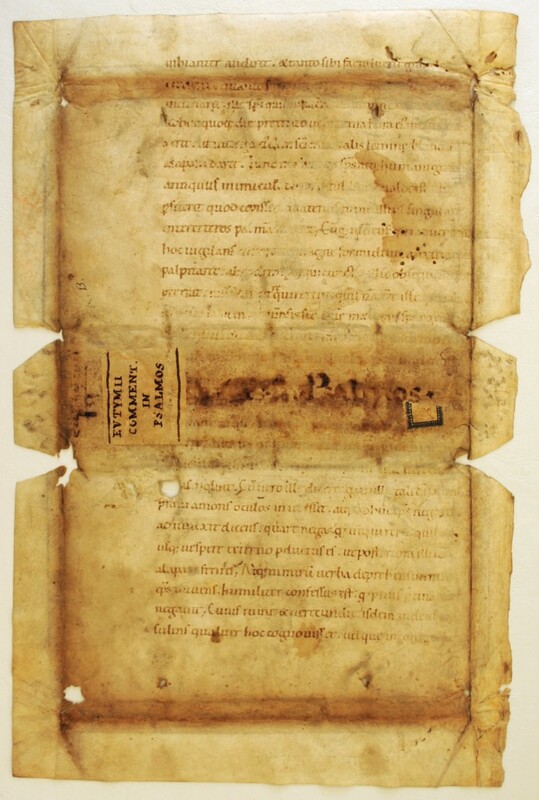 It is not known (anyway by me) which owner or institution possessed the bound volume, or whether that owner was responsible for providing its cover and reusing a leaf from the dismembered Gregorian manuscript for the vellum wrapping of the boards of some kind. The several layers of titles or labels on the spine identifying the contents of the text within the interior — as well as their signs of heavy wear, rubbing, exposure, and other forms of damage — imply an extended period of storage (and perhaps use) within a collection, if not more than one collection. Perhaps the initials R.B. entered in Capitals in ink at the top left-hand corner of the “front cover” of the Euthymius volume represent the name of an owner, user, or visitor — or a pressmark of some kind? Such seemingly small clues might guide the quest in the light of further knowledge. 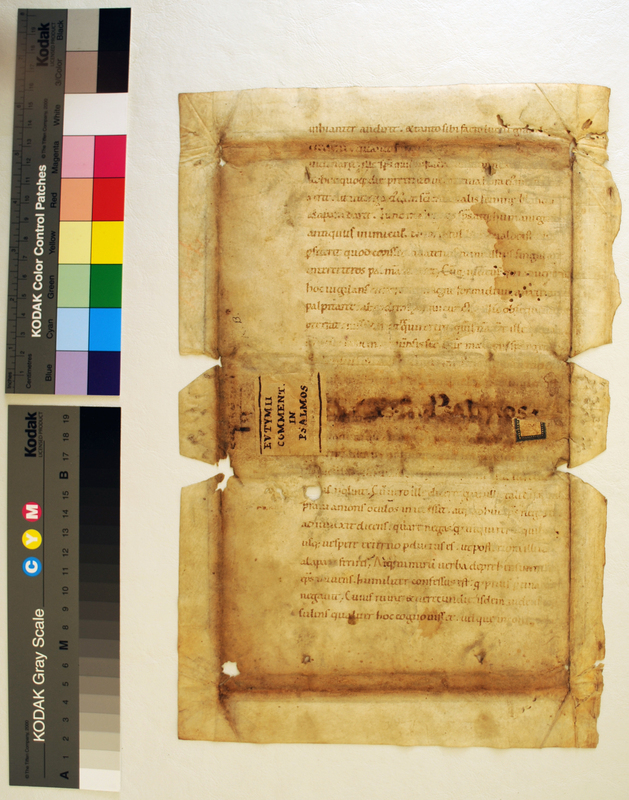 Anyway, the availability of the leaf, already removed from its small, fat volume of Euthymius, for acquisition in France some ten years or so (of uncertain number) before 2007 may indicate a possible circle of transmission, retrieval, and redirection for the fragment (and its volume?) by the end of the 20th century, if not earlier. 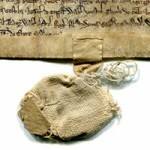 At least we can say, on the testimony of the Owner, that its “Find-Place” lay within the sphere of one source in the Département of Saône-et-Loire, France, from whom, from about 1999 onward, this Item and others within the Illustrated Handlist came into this assembly of manuscript, documentary, and early printed materials of divers dates, origins, characters, and sources. The quest continues. 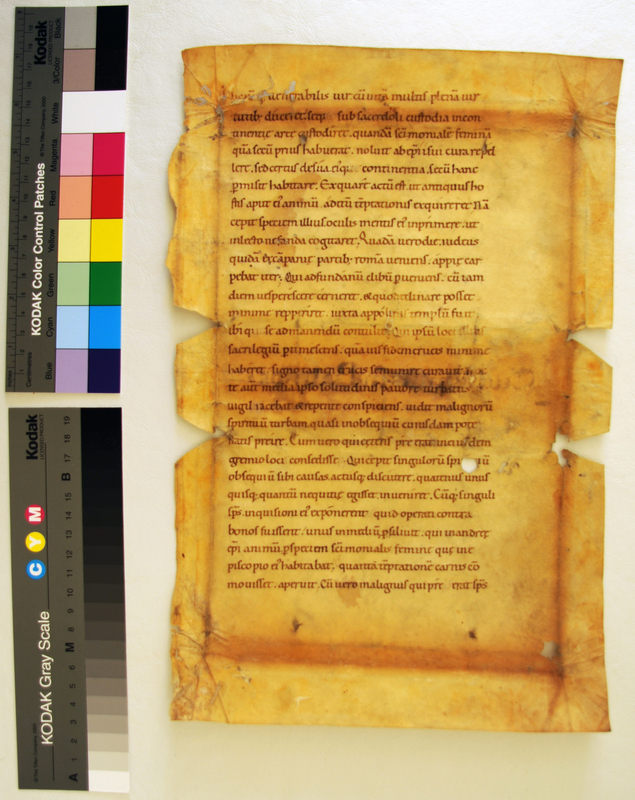 Do you know more about the former manuscript, the work of its scribe, and the former volume which this detached leaf, refashioned, covered for an extended period of time somewhere? We look forward to hearing more about ‘A leaf from Gregory’s Dialogues reused for Euthymius’. Please add your Comments below and Contact Us!